If you bought a new phone, your most urgent need must be transferring all your important data, such as contacts, messages, call logs, photos, music, videos, calendar and so forth from your old phone to the new phone. However, you certainly know that sharp tools make good work! Thus, it’s very critical to choose the appropriate phone transfer app. To serve your desires, this blog will introduce you 3 best data transfer app, you can select the most suitable for your own one. 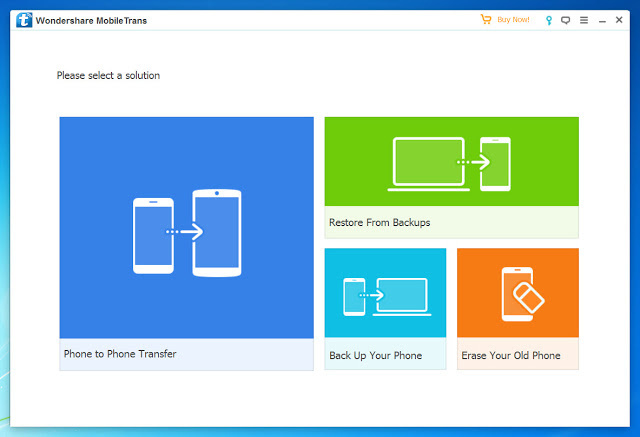 Mobile Trans is a powerful phone data transfer, backup, restore, and erase application developed by Wondershare. With this program, you are able to transfer several types of phone data, including photos, videos, music, contacts, messages, and apps between devices with different operating systems. Moreover, this program yet additionally permits you to backup your phone data to the computer and restore data to another device later. 1. Transfer photos, videos, calendar, contacts, text messages, music and other file types between Android, iOS, WinPhone, and Symbian directly. 2. Create a backup of your phone on computer and restore backup files from BlackBerry, iTunes, iCloud, OneDrive, Kies to your phone. 3. Works perfectly with Apple, Samsung, HTC, LG, Sony, Google, Huawei, Motorola, ZTE, Nokia and more smartphones and tablets. 4. Mac users have the option of permanently deleting photos, contacts, messages, call logs and all private data on your old phone. 5. MobileTrans is absolutely well suited with both of Windows and Mac platforms. 1.MobileTrans can transfer and restore 5 contacts for free. 2.Enable you to wipe out your old phone data permanently. 1.This mobile transfer software is too expensive to buy. 2.You have no a 30-day money back guarantee. Gihosoft Mobile Transfer is a superb cross-platform mobile transfer app, which can not simplest assist you to transfer contacts, SMS, call logs, photos, videos, music, calendar and more to the new phone with no risk of loss or leaks, but also enables you to backup your phone data to the computer, and restore data from previous backup files on every occasion you need. 1.Transfer various types of content such as contacts, SMS, call logs, photos, videos, music, calendar and more among Android, iOS, and iTunes. 2.Backup your phone data to the computer and restore data from previous backup sessions or iTunes backup files to any Android or iOS device whenever you need. 3.Transfer data from Android to Android, iPhone to iPhone, iPhone to Android, iTunes to Android, iTunes to iPhone, Android to iPhone, iPhone to PC, Android to PC. 4. Support is provided for numerous sorts of Android and iOS devices such as Samsung, Huawei, LG, One Plus, Motorola, HTC, ZTE, Sony, iPhone, iPad, iPod Touch. 5. Gihosoft Mobile Transfer is available for both Windows and Mac platforms. 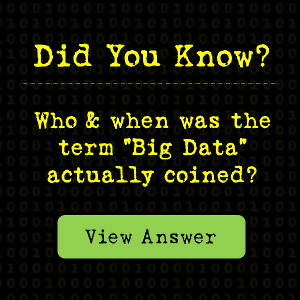 It provides reliable data transfer with no risk of loss or leaks. 1. It is free to try and 100% secure to download and buy. 2. If you pay the bill by Paypal, you 'll be able to get a $5 off. 3. Gihosoft Mobile Transfer supports 30 days money back. 1. It has no access to erase your phone data. 2. It cannot allow you to restore data from iCloud backup. iSkysoft Phone Transfer for Mac or Windows is a simple yet effective phone transfer app that allows you to seamlessly transfer several types of files, consisting of photos, music, videos, text messages, contacts, call history, and apps between Android, iOS, and BlackBerry. 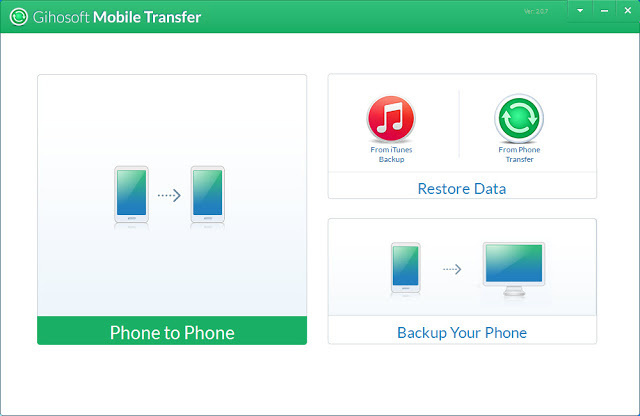 Besides, this mobile transfer app can also be used to backup phone data to the computer, restore phone data from backup, and erase old phone data completely. 1. Transfer contacts, messages, call history, photos, music, videos, calendar, apps and other file types between Android, iOS, and BlackBerry. 2. Back up phone data to the computer and retrieve data from iTunes, iCloud or BlackBerry backup to your new phone when necessary. 3. Data can be transferred from Android to Android, Android to iOS, iOS to Android, iOS to iOS, iTunes/iCloud/BlackBerry Backup to iOS. 4. iSkysoft Phone Transfer for Mac enables you to permanently wipe out all data from your phone, not just the existing data but also the deleted data. 5. This phone transfer app supports more than 3,500 phone models and different networks. 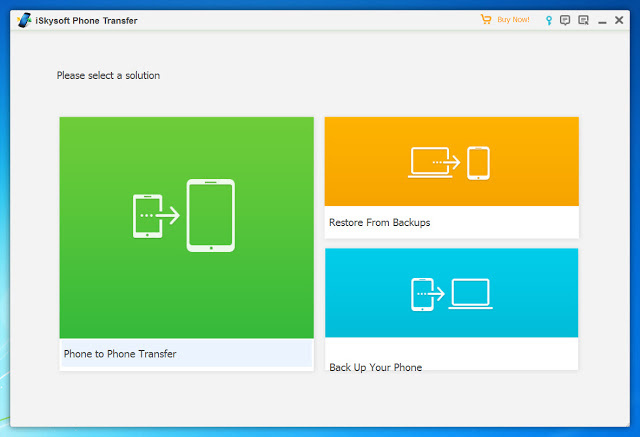 1. iSkysoft Phone Transfer is fully compatible with Windows and Mac platforms. 2. It can restore phone data from iTunes, iCloud or BlackBerry backup. 1.iSkysoft Phone Transfer for Windows cannot erase your phone data. 2.If you want to transfer or restore apps data, you need to root your phone.